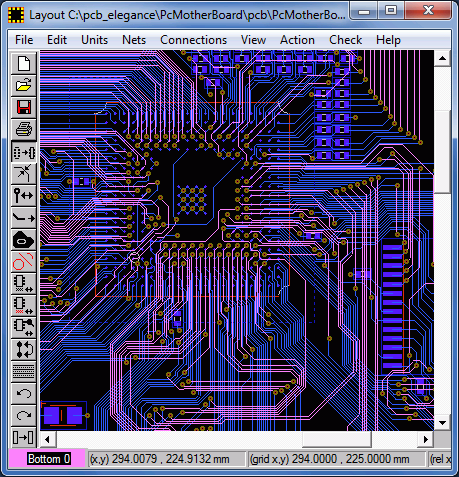 PCB Elegance is a suite of circuit board design tools for Windows. Including schematic capture, board layout, and manufacturing file generation. Easy to learn. The user interface is logical, follows modern conventions, and is consistent across the different tools. Fast zoom and panning with the mouse. Able to handle complex designs. 2000+ components, 40000+ traces are no problem. A Pentium motherboard is included as an example design. Keyboard shortcuts are listed next to each menu item so may be learned as you go. They can also be modified. Colours of schematic and layout editors can be changed. Bicoloured patterns are supported in the layout editor. Route with online DRC, dynamic rats nest, trace dragging. Active schematic select allows selecting groups of layout components from the schematic editor. Edit parameters of multiple components at once. Schematic symbol editor allows the creation of complex schematic symbols quickly. Symbol libraries are included. 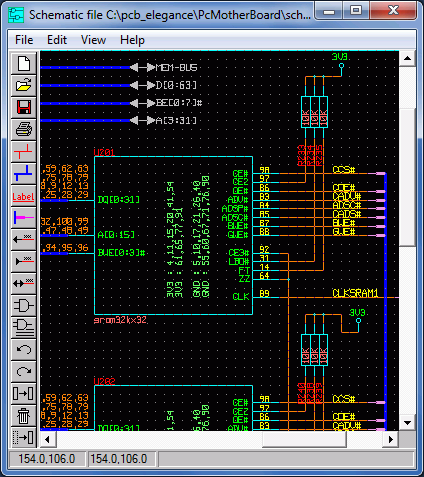 Geometry editor contains wizards for integrated circuits DIP, SOIC, BGA, etc. ... see the features list for more.